Providing you the best range of leno bag, pp leno bag, leno fabric bag and tubular leno bag with effective & timely delivery. 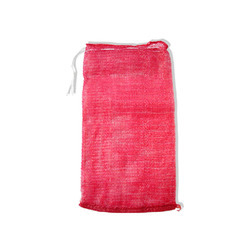 Backed by rich industry experience, we are engaged in offering our clients Leno Bag. The offered leno bag is used for packing onions, potato, garlic, fruits, vegetables & also for packaging flowers. Our leno bag is available in numerous sizes so as to meet the demand of customers. This leno bag is quality by our quality inspectors on several parameters in order to supply flawless range to our customers. As per the variegated requirements of our clients, we are offering a broad collection of PP Leno Bag. The offered leno bag is designed using high quality of material & leading techniques so as to fulfill all norms of industry. Also, this leno bag is used for meeting the packaging demands of products like onions, cabbage & corn as well. We offer this leno bag in various sizes & customized options in order to meet various requirements of customers. 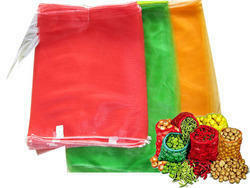 We provide Leno Fabric Bag for packing vegetables can keep the vegetables fresh. 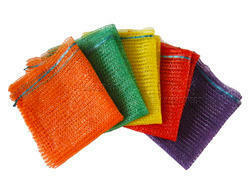 Permeability of these bags helps in significant saving in energy cost in cold storage systems. Our bags keep products safe and fresh for long durations have excellent re-usability. Our range of bags are capable of carrying fruits and vegetables in bulk quantity. Being a highly effective, lean and fast-moving organization, we are highly instrumental in providing an extended array of Tubular Leno Bag. This leno bag is checked by quality controllers on numerous parameters in order to ensure its excellence. Offered leno bag is made available with drawstring closures and are widely used for meeting the packaging demands of products. Customers can avail this leno bag from us at nominal prices.